GTA offers comprehensive Karst services. Karst is a problematic subsurface condition (a geohazard) that occurs in areas underlain by limestone and dolomite bedrock, which are present in most of the mid-Atlantic states. The bedrock “dissolves” over time, leaving voids in the bedrock, which allows the overlying soils to erode into the voids. 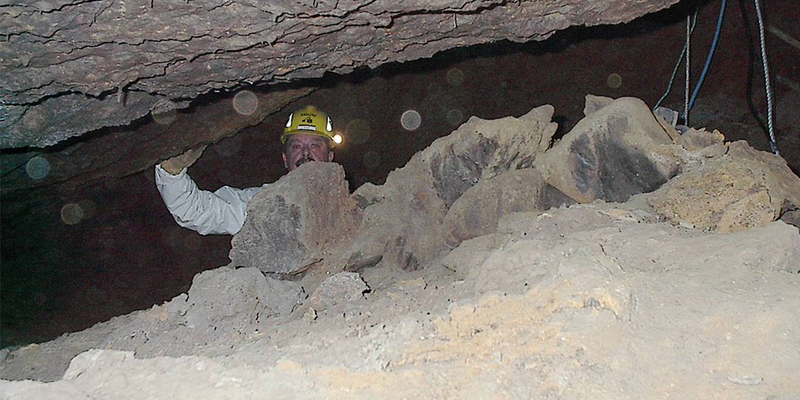 Karst features can have a significant and costly impact on construction. The key to construction within Karst is to identify the site-specific risks early and implement engineering solutions before costly construction issues arise. GTA’s professional staff and drilling department provide comprehensive evaluations of Karst conditions, such as site reconnaissance, aerial photogrammetric analysis, geophysical methods, SPT sampling, CPT testing and rock coring, which is important for development of the appropriate engineering solution. Stormwater management, infiltration of water, and implementation of drainage measures. Site grading issues, including bedrock depth/variability, and soft/unstable soils. Design of deep and specialty foundation systems and ground improvement systems. 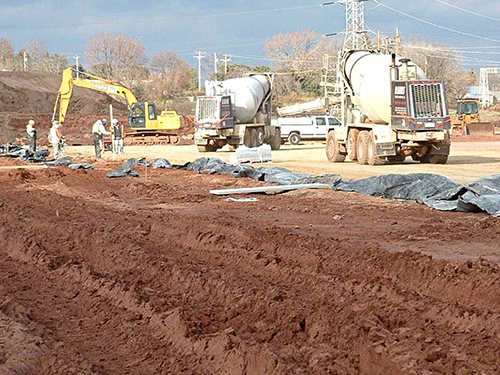 Treatment of soft, unstable soils using chemical stabilization and geosynthetic reinforcement. GTA’s geotechnical consultation, value engineering, and construction testing services performed for construction of a 1,100,000-square-foot manufacturing and warehouse facility is a testament to the value that GTA adds to complex projects. GTA provided value engineering and geotechnical consultation for many problematic soil and geologic conditions encountered during construction. 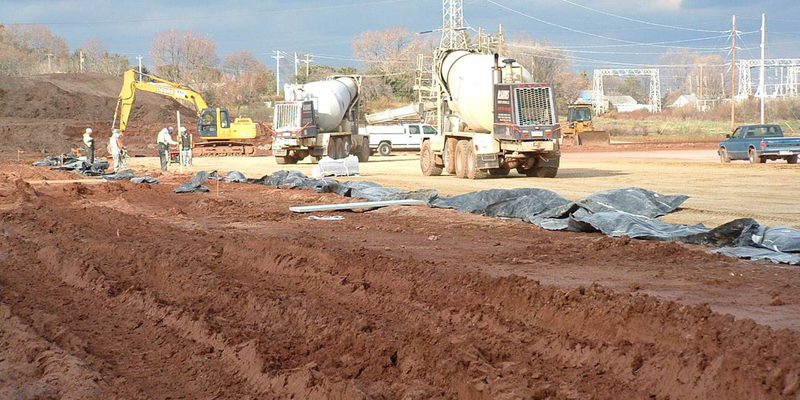 GTA prepared mix designs using lime to stabilize the clayey soils that were used as building pad fill. This allowed the placement of fill through the fall and winter months, which helped keep the project on schedule. Additionally, the lime treated surface layer of the building pad allowed high volumes of heavy traffic to travel on the building pad during the full duration of the project. GTA recommended the use of full depth reclamation (FDR) for the one-half mile long entrance access roadway. The use of FDR resulted in significantly lower pavement costs than full depth removal and replacement. GTA performed pavement design analysis for the 15-acre, 450-space tractor-trailer parking area that will support traffic from over 200 tractor-trailers per day. GTA also provided consultation for areas of shallow groundwater encountered during mass grading and repair of sinkholes encountered in the stormwater basins. During construction, GTA provided testing of structural fill, utilities, concrete, foundations, precast panels, slabs, masonry, structural steel, and asphalt and concrete pavements. This included over 30,000 cubic yards of concrete placed for the 1,100,000-square-foot floor slab. At times, GTA provided up to four technicians on site working 24 hours a day, to perform the concrete sampling and floor flatness testing. 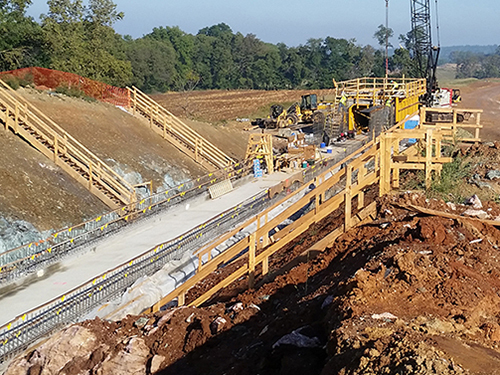 GTA has geotechnical engineering and construction testing services for 17 different projects at a Lancaster County manufacturing facility. The site is located within a carbonate rock environment with severe sinkholes, caverns, very erratic rock, and soft unstable soils. GTA’s involvement with the complex construction projects, all performed within very tight schedules, is an excellent example of GTA’s engineering expertise and client service. Geotechnical explorations and recommendations were performed for six different building projects, with buildings that ranged in size up to a four-story, 360,000-SF building. Test borings and cone penetrometer testing (CPT) was performed up to depths of 75 feet within the soft, unstable soils. GTA designed specialty foundation and shoring systems, such as micropiles, compaction grouting, soil nails and soldier pile walls. 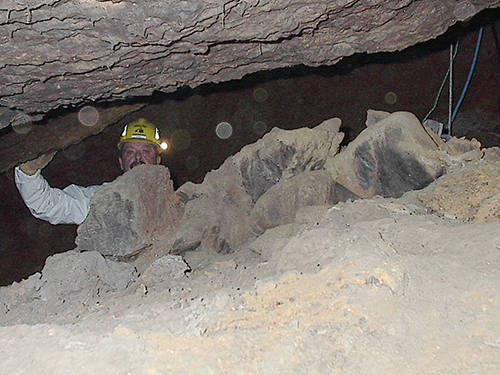 GTA used extensive geophysical analyses, including ground penetrating radar, electrical resistivity, and terrain conductivity, to identify the potential for sinkholes and caverns. Geophysics were used for large tracts of land to identity concerns, as well as within existing buildings to identify areas of sinkholes and caverns below slabs and foundations. GTA also entered a 50-foot-wide cavern located below an existing building to evaluate the stability and perform a survey of the dimensions. GTA provided recommendations and construction testing for use of low mobility grout to backfill areas of the cavern that were potentially unstable. Construction observation and testing performed for this facility consisted of soil compaction, utility installation, cast-in-place concrete, footings, slabs, masonry, and structural steel. 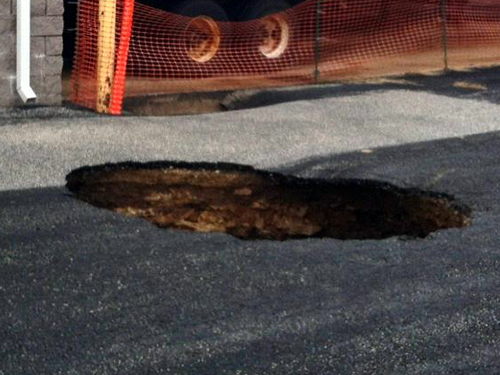 On numerous occasions, GTA provided recommendations for sinkhole repair within paved areas, stormwater basins, at utility manholes, within existing buildings, within trench excavations, and below foundations. GTA provided exploration and recommendations to minimize the damage caused by sinkhole formation within an active retail store loading dock area. 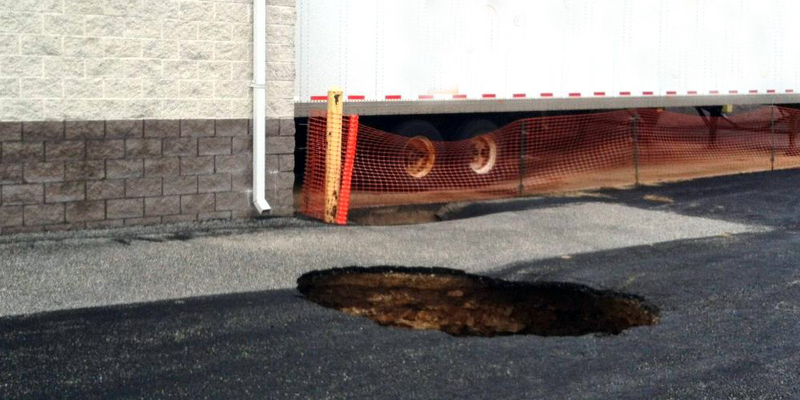 The sinkhole at an active retail toy store was discovered by store employees after a tractor trailer collapsed the pavement surface adjacent to the loading dock. GTA was contacted for consultation, and upon initial observation, it was discovered that approximately 400 square feet of the two-bay, concrete loading dock apron was also undermined by the sinkhole. The sinkhole was encroaching the adjacent building footings. The loading dock was immediately shut down, requiring employees to unload the trailers by hand through the access doors. As the owner was anxious about the rapidly approaching holiday season, GTA recommended a temporary solution to backfill the void below the loading dock, allowing the trailers to be parked safely. Once the busy season was over, GTA prepared a subsequent plan of compaction grouting. Compaction grouting entails the drilling of hollow steel pipe below the ground surface, and injecting low slump grout into the soils and rock. As the pressurized grout is injected, the pipe is withdrawn incrementally, creating a continuous column of grout. The high placement pressure allows more grout to be pumped into voids and soft softs, and less grout into the more competent materials. 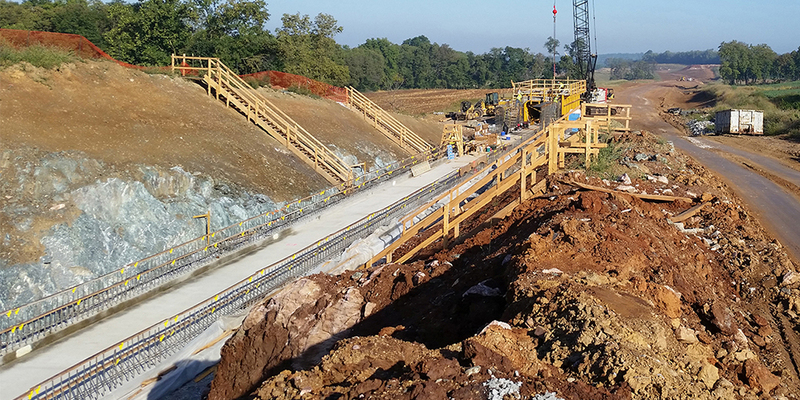 The intent of the program was to reduce the risk of future sinkhole formation by filling voids, and increasing the density of (compacting) the soils, thus improving the conditions that are conducive to sinkhole formation. Two episodes of compaction grouting were performed, involving 82 individual grout points, and approximately 260 cubic yards of grout. Upon GTA’s recommendations, the owner also redesigned the open section roof drains to flow into a closed piping system that discharges directly into the adjacent SWM basin, and repaved the loading area in an effort to reduce the amount of surface water entering the sinkhole-prone area.